The Powell family are learning how to use their amazing new powers to help the world. Unfortunately, they’re not going to be able to do that much longer. The ratings for ABC’s No Ordinary Family have not been good and the series is sure to be cancelled. What can you do? Remember, the ideal scenario for ABC is for many millions of people to watch the show on their television sets, while it’s being broadcast. Unfortunately, ratings are put together based on a sampling of viewers. If you’re a “Nielsen household,” your viewing is being counted. If not, it’s not. However, if you like No Ordinary Family and want to see it continue, there are a few things you can do to help. If you’re a Nielsen family, watch the show whenever it’s on. If not, watch it on ABC.com or purchase episodes online so your viewing will be directly counted. Encourage others to watch the show. You might know a Nielsen family and not be aware of it. Call the network at (818) 460-7477 and leave a comment. Be polite and tell them how much you like the show. Check out the list of efforts started by some devoted fans on the ABC site. We, the undersigned, like watching No Ordinary Family on the ABC network. The show has the right blend of heroic action, drama, and humor. Please find a way to keep No Ordinary Family on the air. We are devoted viewers who will continue to watch the program, encourage others to do the same, and will support the series’ advertisers as well. Please keep it going, either on ABC or, if necessary, on another Disney-owned channel. I didn't know about no ordinary family until i watched it on hulu. I was captivated by the show immediately. Please bring it back. I love this show. It's very entertaining and it hold my attention, which if something most shows cannot do. Please bring this show back. It would mean a lot to me and others who also love this slow. I loved No Ordinary Family. It was thrilling and captivating and had the potential to be an even more awesome series. Plus, I need to know if George is gonna be okay and if he gets powers. Please bring it back. Please! No ordinary family is a great show it deserves a better ending than a cliffhanger please bring it back. My husband and I loved season 1. Watching reruns now. Bring it back please! Amazing so sad to see it cancelled I really really want it back. My kids and I love it--carry on with it, please! It is unusual to have a series that pleases both my girls and boys, as well as mum and dad! To whom it may concern, I recently became aware of two extremely original and entertaining TV shows by the titles of 'No Ordinary Family' and 'The Neighbors', whilst browsing my pay TV account. Though these particular shows were bizarrely cancelled over 4 years ago (such a captivating premise for each of these shows that the cancellation is no less than bewildering), it has come to my attention via the most rudimentary Google search that there are a multitude of fans and supporters in mourning for the series 'No Ordinary Family' and 'The Neighbors. I write to you in the hopes that you will PLEASE reconsider your decision in axing these shows. I believe that you do indeed have enough supporters for each of these shows to be successful in ratings and can only wonder if the selected day for airing, along with nominated time slot had anything to do with the declining ratings as opposed to not nearly enough of a following? Please, PLEASE ABC, reconsider and bring back the production of these two exceptional and wonderful shows. I'm sure the fans will happily and gratefully accept different actors in place of some of the original cast due to continuity issues. Please ABC, PLEASE. Sincerely yours, Nicole Ayla. I love this show and i would watch faithfully if there was a season 2. Probably my favourite series of all time! Preferred over game of thrones and plenty of other current shows, disgusted the viewers never got a proper tie up to the climactic ending which matches speilburg level directing. It's a sad day when you first watch the show on premier night. After so, you record every episode till the end of the season. You watch every night you get home from whatever you we're doing. You sit back, relax and enjoy the plot. Then you're asking about next season... oops! No next season. That's garbage! This show deserves a reboot. I've watched it when it began and I am watching it now. To me, it is better than Greg Berlanti's Flash and Arrow! They just need to pick up where they left This show is the bomb. Please, please make another series my whole family are addicted to this. Please make a season 2! This was such a good series I need season 2!!! 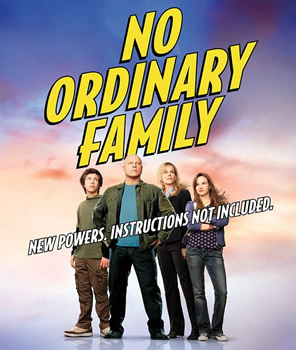 More about: No Ordinary Family, No Ordinary Family: canceled or renewed?